Dinner: We ate dinner at Bordeaux's (108 W Center St, Kyle, TX‎ - (512) 268-3463‎) in downtown Kyle. 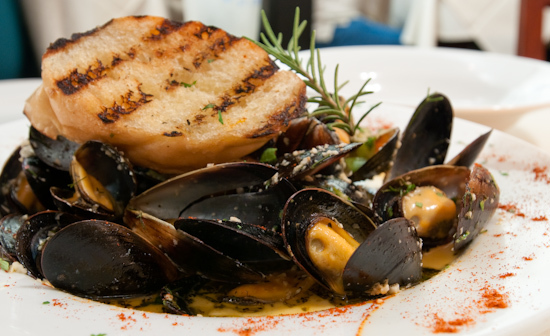 We started with Pan Steamed Chilean Blue Mussels In white wine, red chili & fennel broth. Served with grilled French bread. ($12) The mussels (which came in a large quantity) were quite good, salty and spicy from the broth it was served in (more broth than I've ever had served with mussels before, but it worked pretty well). Unfortunately, the bread was not anything close to French bread. The crumb was more like white sandwich bread and the crust was chewy but not at all crusty or hard. The flavor was not far from white bread either. 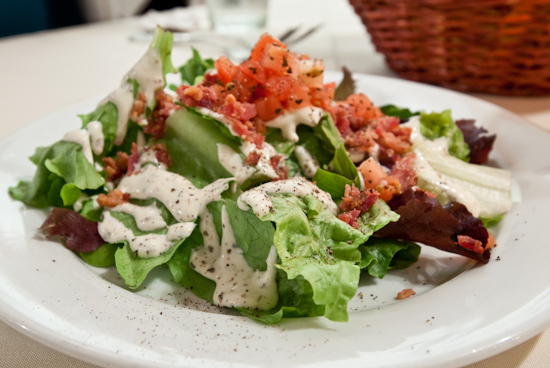 We both had salads (which came with our mains) - Tina had the house salad with Pesto Ranch dressing which worked very well with the fresh chopped tomatoes and shredded bacon. I had the Caesar salad which I felt was over-dressed. For the main course, Tina had the Deep Sea Pasta Jumbo shrimp and blue crab tossed in a smooth asiago cream sauce with sun-dried tomatoes, basil-marinated tomatoes & pine nuts. 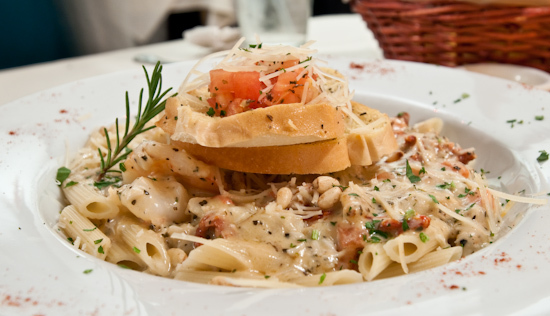 Served over penne pasta and topped with parmesan cheese and toasted herb crostinis. ($18) The penne was cooked through (not al dente) which worked well in this preparation (I'm not a believer that all pasta should be al dente all the time - although I do prefer it that way). I did feel that there were too many sun-dried tomatoes in the sauce and the dried pre-shredded parmesan cheese isn't all that appetizing. The shrimp was cooked just right and the cream sauce contained quite a bit of shredded blue crab. Overall, the dish had a sweet note to it that Tina disliked (she generally shies away from sweet dishes that aren't dessert). 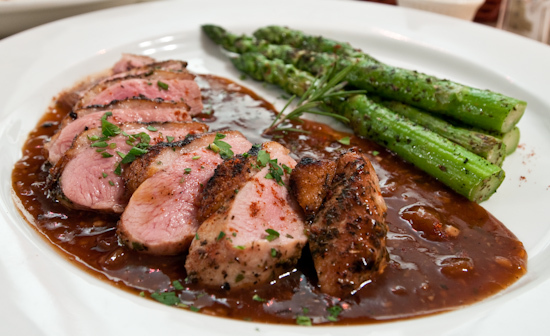 I had the Pan Roasted Duck Breast 6oz duck breast pan roasted to medium and served with a delicious blackberry brandy demi-glace and grilled asparagus ($18) The duck breast was cooked perfectly and served at maximum tenderness. The flavor of the breast and the sweet sauce worked well together, but I could detect an iron taste (think mild liver flavor) in the breast. Still, I was happy with the dish. At these prices, I'm not looking to be blown away - so I was pretty happen that most of the meal was well executed. 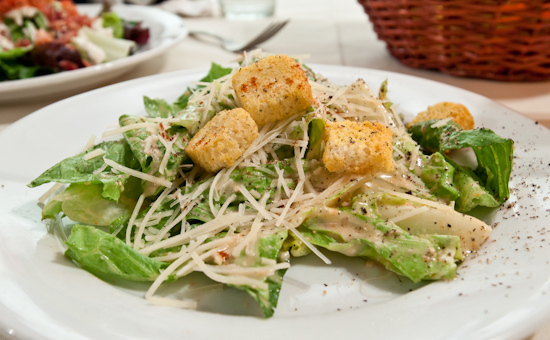 In fact, the only things I truly did not like were the bread and my Caesar salad. 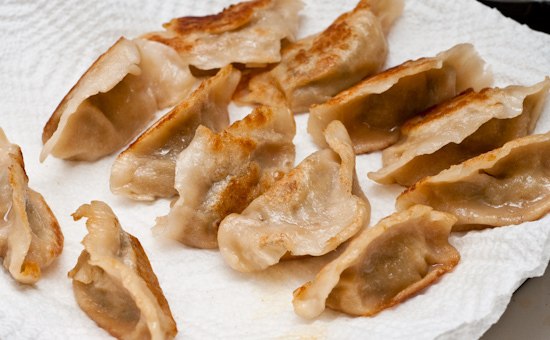 Lunch: We scrounged around for some leftovers and ended up pan-frying left over dumplings and reheating some beer chicken drumsticks. Wow, that looks pretty delicious for Kyle and that price point!